A two-story building on the beach and a powerful shoreline fortification on publicly-owned land – these are the new construction “achievements” in the vicinity of Dogan’s Seraglio in Park “Rosenets” in Bulgaria’s Black Sea city of Burgas. They can also be seen on Google Earth. However, the authorities have failed to notice that somebody has managed to build on the shore in a blatant violation of the Constitution and several laws. This emerges from the reply by the Ministry of Regional Development and Public Works. The Burgas Regional Administration has completely ignored our numerous inquiries asking for comments and for providing us with the building permits for these sites. The new and apparently illegal construction is a follow-up of a series of violations associated with the building, known as the Dogan Seraglio, for whose legitimization several institutions, such as the Directorate for National Construction Control (DNCC), the Burgas City Hall, the Burgas Regional Administration and the Ministry of Tourism, have been harnessed over the years. Bivol has been following the “Dogan Seraglio” saga since its very beginning in 2014, when a company associated with the Movement for Rights and Freedoms (PPS), the party largely representing the Bulgarian Muslim minority, started to build hastily on the beach. Because of this, we also explored the history of the properties in Park “Rosenets”, which illustrates the brutal plundering of public lands on the coast by the ruling establishment, dating all the way back to the fall of the Communist Regime in Bulgaria. The terrains were originally the patrimony of the state-owned Neftochim. After its privatization by the Russian Lukoil, nearly 320 decares of “golden land” on the coast became property of the Lukoil retirement funds – Lukoil Guarantor-Bulgaria Pension Insurance Company and Voluntary Pension Fund “Lukoil Guarantor-Bulgaria”. In 2007, these lands were sold to the Russian company “Straight Line” for only BGN 28.7 per square meter. At that time, just ahead of the crisis, similar properties in the same vicinity were selling for over BGN 500 per square meter. The motivation behind this apparently unprofitable deal for Lukoil is obvious. Behind “Straight Line” is the Cypriot offshore TROXY TRADING. It is owned by another offshore from the British Virgin Islands – FCM GROUP HOLDING. The carefully concealed owneship is also concealing the fact that precisely Lukoil’s Executive Director, Valentin Zlatev, is behind the transaction. The evident link is attorney Alexander Velichkov. He is the Head of the Legal Department of Lukoil Bulgaria and participates in the management boards of the retirement companies that have sold the land. At the same time, Velichkov is a proxy for TROXY TRADING, which is housed in his office. Therefore, the same people end up being on both sides of the deal, and the sale itself inflicts damages to the oil giant of Vagit Alekperov amounting to tens of millions of euros. In March 2014, part of the plot (nearly nine decares) was resold by “Strait Line” for BGN 1.7 million to the company “Hermes Solar”, registered in early 2011. Its original owner is the secretary of the late Ahmed Emin, then personal assistant of Ahmed Dogan – former leader and Lifetime Honorary Chairman of DPS. Emin, who was seen as the person in charge of the cash flows to and from the party, died under mysterious circumstances on October 17, 2008 in Dogan’s Seraglio in the Sofia suburb of Boyana. The case was labeled suicide. The address and contact details of the company in the Trade Register, give good reasons to believe that it is part of the notorious circles of the DPS’ business interests. “Hermes Solar” has two loans from the collapsed private lender Corporate Commercial Bank (CCB). The first one is from March 2012 for nearly BGN 12 million and there are overdue interest payments of BGN 100,000. The second one – in the amount of about BGN 7 million is from July 2013 and there are overdue interest payments of BGN 50,000. They are written off by the Bank’s receivers as “bad loans” without sufficient collateral. However, both “Hermes Solar” loans have found a warm home in private lender First Investment Bank (FIB or Fibank), where the controversial DPS lawmaker and media mogul, Delyan Peevski, transferred his loans shortly before the collapse of CCB. The “Hermes Solar” loans have been serviced 100% through a direct payment by Fibank, at approximately the same time when the construction began, notes the financial journalist Miroslav Ivanov. As early as 2014, even the naked eye could see that the five floors in the central part of the building exceed the legal parameters, set by the Black Sea Coast Development Act. However, the DNCC saw nothing unlawful in the building, designed by DPS’ favorite architect, Kalin Tiholov. The very tall tower in the central part of the building was declared a “protrusion”, an “architectural element” that was completely legal under the Territorial Development Act. As the construction is a fourth category one, under this Act, the control is carried out by local authorities, DNCC noted then and passed the ball to the Burgas City Hall. The City Hall, which is controlled by the ruling party Citizens for European Development of Bulgaria (GERB), failed to react whatsoever to reports of illegal construction. What is more, all of its actions over the years have obviously been in support of this construction. Bivol’s research showed that the lucrative land had been ready for construction by the end of 2013. With a Detailed Territorial Development Plan, approved by the Burgas City Hall on the proposal of Mayor Dimitar Nikolov (GERB), 175.5 decares of the former vacation area “Rosenets”, owned by the Russian company “Strait Line”, had been slated for resort construction. After the purchase of the land, “Hermes Solar” swiftly obtained building permits from the City Hall and the chief architect of Burgas issued an authorization to block the municipal road to the coast with a barrier that remained there for years to deter curious visitors. For these “Seraglio” merits, and perhaps other deeds, the Mayor of Burgas, Dimitar Nikolov, together with Dogan received a distinction from the Sofia “Library University”, known as a stronghold of agents of the former Communist secret services – the State Security. The beach near the Seraglio, where a white two-story house is now emerging, gained media prominence in the summer of 2016, when citizens tried to sunbathe there but were brutally driven out by people who had presented themselves as “people from the special services”. The case was filmed with mobile phones and distributed online. The Ministry of Tourism then launched a probe, from which it emerged that the terrain was not a beach but farmland that borders the Black Sea. This is an absurd claim, given that the small beach has existed there probably for hundreds of years, and the terrain around it has always been a forest. During a visit on location, the Director of Bivol, Assen Yordanov, and editor-in-chief, Atanas Tchobanov, who accompanied colleagues from the German public radio, were “welcomed” by guards. The latter were well aware of the identity of the journalists and hid their faces from the cameras. The guards said that the municipal road is “privately owned” and cannot be reached from the port. When urged to produce legitimate IDs, they presented themselves as “tourists” and did not answer questions whether they represented state or private structures. While the journalists of Bivol were disputing this factual situation, citing the law, the “Hermes” motor yacht docked at the pier and three people came down from it. We were able to capture them on picture. The brunette in the photo was identified as Snezhana Karova, managing director and listed owner of “Hermes Solar”. In the next DoganSeraglio episode, Burgas’ Regional Governor Valcho Cholakov resolved the issue with the access to the pier. He just wiped it out as public property and sold it to Karova’s firm. 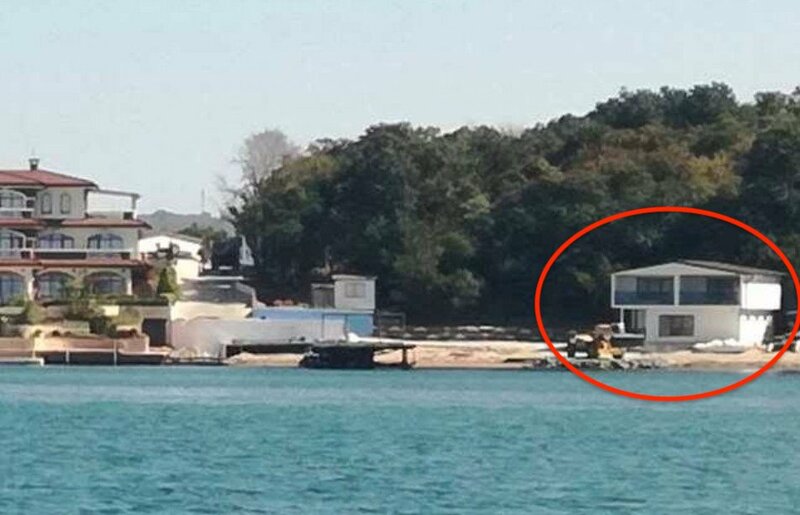 A piece of our sovereign border was appropriated so that Dogan could keep his yacht there, and to halt access to the beach for unwanted visitors. The barrier on the municipal road was legitimized through another trick. It turned out that the Seraglio had an “unlimited” status of “unfinished construction site” because it did not have the required Act 16 – a permit to use the buildings. And in the absence of such, a construction site must be secured, according to the “Safety and Health Plan” adopted by the City Hall in order to prevent harm from the construction activities to some passerby. This was actually the reply by the City Hall to our request under the Access to Public Information Act (APIA). So “de facto”, the government demonstrates that it does not respect the laws when it comes to please the whims of the Lifetime DPS Chairman, also known as a State Security agent with the codename “Sava”, as a consultant in hydrology projects and recently, after his purchase of the Varna Thermal Power Plant – as a large industrial owner. However, the situation with the new construction outperforms all of the impudence that has happened around the Seraglio up to now. “De jure”, this construction on land belonging to the state, without building permits and without the knowledge of the authorities, is pure arbitrariness, which is punishable under the Penal Code. In this sense, we further consider this publication as a formal occasion for the Prosecutor’s Office to launch an investigation, and the DNCC to issue an order for the removal of the illegal sites. But “de facto”, this is unlikely to happen. Update: After this publication, our editorial office received an e-mail with a reply by the Burgas Regional Administration. Burgas’ Regional Governor Valcho Cholakov claims that they were unable to find any information on building permits having been issued for the mentioned properties.